Washington, D.C. (December 4, 2014) — A new large-scale, aerial-view painting of Washington, D.C., has been installed at L’Enfant Plaza. 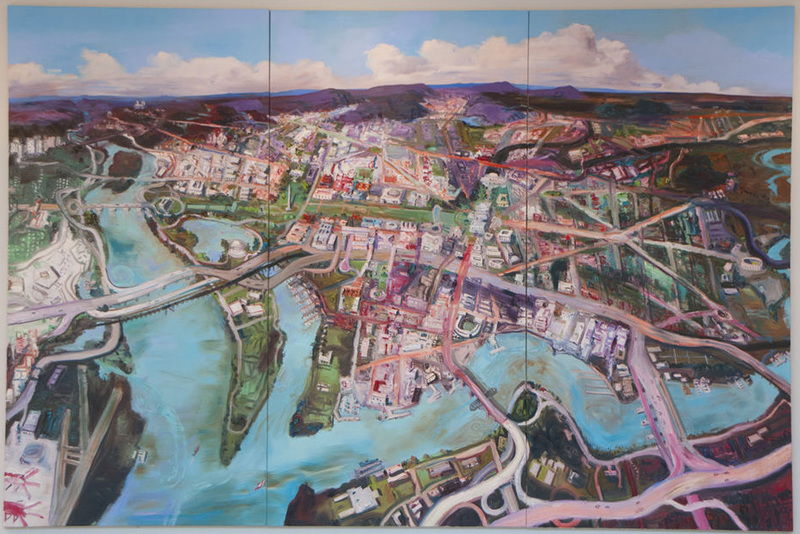 Washington From Above the Potomac, an 8 foot by 12 foot oil painting by Canadian artist John Hartman, was commissioned as public art by The JBG Companies to celebrate the completion of a year-long renovation at 955 L’Enfant Plaza. Hartman is known for his aerial paintings of some of the world’s great cities with high-rise skylines, such as Manhattan, Toronto and Vancouver. Painting the nation’s capital, with its air space restrictions and 160-foot building-height limit, presented some new and unique challenges to this international artist. The end product, eight months in the making, is a striking and mesmerizing work depicting both visceral and ethereal qualities of the city that Hartman intended to convey. He produced a fascinating and insightful 10-minute video showing the steps of his artistic process. Visitors to L’Enfant Plaza can view Washington From Above the Potomac during normal business hours in the lobby of 955 L’Enfant Plaza. John Hartman was born in 1950 in Midland Ontario, and studied Fine Art at McMaster University. He established his reputation with the exhibition Painting the Bay at the McMichael Canadian Collection in 1993. These were large-scale paintings of Georgian Bay, aerial views of the landscape. In the skies Hartman painted stories about the places depicted. His path of painting the intimate and intertwined relationship between people and place took a turn in 2003 when he began painting aerial views of cities as living organisms. These paintings comprised the exhibition and book Cities which toured Canada and internationally from 2007 to 2009. Visit www.johnhartman.ca for more. Headquartered in Chevy Chase, Md., The JBG Companies is a private real estate development firm that develops, owns and manages office, residential, hotel and retail properties. The company has more than $10 billion in assets under management and development in the Washington, DC area. Since 1960, JBG has been active in the communities where it invests, striving to make a positive impact. More information can be found by visiting the company’s website, www.JBG.com, or by calling 240-333-3600. L’Enfant Plaza, an office and retail mixed-use development owned and managed by The JBG Companies, is located at 429, 470, 490 & 955 L’Enfant Plaza SW in Washington, D.C. Linked to the District’s most-connected Metro rail station and positioned as one of the region’s premier mixed-use properties, L’Enfant Plaza includes 650,000 square feet of office space and 120,000 square feet of retail space. More information is available at www.lenfantplaza.com.